Michael G. Ciaccio practices exclusively in the area of personal injury law. He received his Bachelor of Science With Distinction and his Juris Doctorate degrees from the University of Arizona in 1981 and 1984, respectively. Mr. Ciaccio is admitted to practice in all Arizona courts, the U.S. District Court, for the District of Arizona, and the U.S. Supreme Court. He is a member of the Pima County and State of Arizona Bar Associations. He is also a member of the Western Trial Lawyers Association, the American Association for Justice, and is a sustaining and current Board Member of the Arizona Trial Lawyers Association. Since 2011, Mr. CIaccio has been selected as one of The Top 100 Trial Lawyers in Arizona by the National Trial Lawyers Association. He has received the Martindale-Hubbell designation of AV Preeminent, Peer Rated for the Highest Level of Professional Excellence. 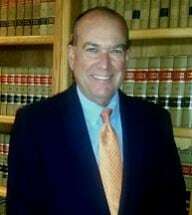 In addition, he serves frequently as a faculty member for the State Bar of Arizona’s course on Professionalism, has served as a Judge Pro Tempore for the Pima County Superior Court, and is selected often as a private, sole arbitrator with regard to personal injury cases in Pima County.